Inspired by the now-famous 0-Point Garden Vegetable Soup, here are THREE insanely delicious, all-new soup recipes that are Point-free...Weeeeee! 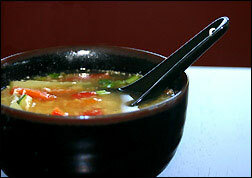 With our optional ingredients, you can customize this soup to satisfy your taste buds. Make it hot 'n sweet (with SPLENDA & FRANK'S RedHot), garlicky (TABASCO Garlic and/or garlic salt), or sweet 'n mild (SPLENDA). Any way you serve this soup, it's zero PointsPlus® per serving! In a large pot sprayed with nonstick spray, place chopped tomatoes along with any juice and seeds. Cook over medium heat for 2 - 3 minutes, stirring occasionally. Add broth and cabbage, and raise heat to high. Once soup reaches a boil, reduce heat to low and cover. Allow soup to simmer for 5 minutes. Season to taste with salt, pepper, and any of the other optional ingredients. Enjoy! Makes 5 generous 1-cup servings. This beauteous bowl of soup is almost as much fun to make and look at as it is to slurp! Begin by cutting all veggies (scallions included) into matchstick-sized strips (use a vegetable shredder if you have one!). In a large pot, combine all ingredients except for the scallions (and lemon wedges). Bring to a boil. Once soup has reached a boil, reduce to medium heat (a low boil) and add scallions. Cook for approximately 5 minutes, until veggies are limp. If desired, serve with lemon wedges for a citrus-y touch. Makes four 1-cup servings. Be creative… At just a PointsPlus® value of 0* per serving, turn this into Shoestring Egg Flower Soup! To do so, pour 2 large egg whites into a container with a spout (like a measuring cup). Once soup has cooked for 5 minutes at medium heat, remove from heat and VERY slowly pour in egg whites while VERY quickly stirring in one direction. The result will be gorgeous bursts of egg bits in your yummy shoestring soup! With chunks of fresh veggies and a creamy pumpkin kick, this soup ROCKS! Cut pepper and zucchini into large chunks. In a large pot, stir to combine broth and pumpkin. Add celery and cook on high heat. After a few minutes (once soup is hot but not yet boiling), add zucchini and peppers. 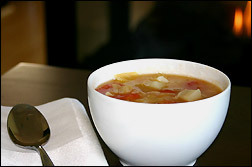 Once soup has reached a boil, reduce heat to low. Simmer for 5 minutes, or until veggies are tender. Add salt and pepper, if desired, and dig in! Makes five 1-cup servings. HG Heads Up! To reduce the sodium in these soups, seek out low-sodium or salt-free broth. 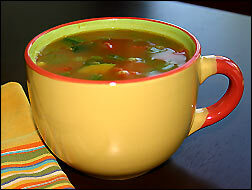 Share these ROCKIN' soup recipes with EVERYONE! Click "send to a friend" NOW!